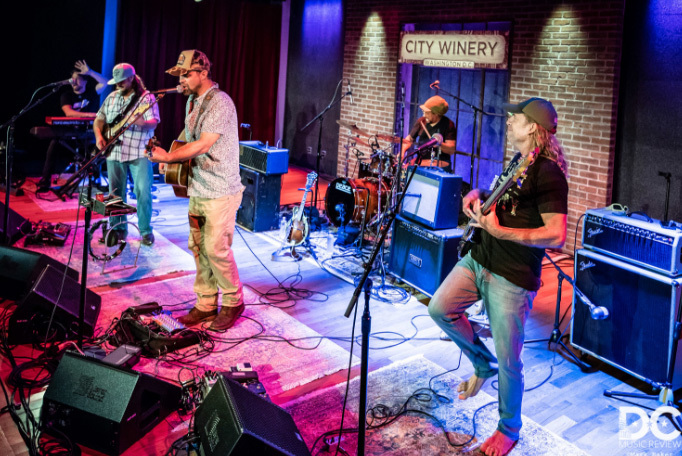 Making their City Winery DC debut on August 16th, the Honey Island Swamp Band played to a dedicated and jubilant crowd very familiar with their swamp rock. Honey Island Swamp Band was formed almost 10 years ago in San Francisco after the band members were displaced from New Orleans by Hurricane Katrina. Their music has been described as “Bayou Americana”. This award winning band released its first album in 2009, and their long awaited new album came out last year. While the dinner-style table setup might have suggested that fans would have trouble dancing and matching the on-stage energy, the crowd quickly left their seats and found room to dance and groove. The audience loved when they sang, “…Goin’ where the water tastes like wine…” during the “Going Down the Road Feeling Bad” cover, most appropriate since they were playing in a winery. The evening came to an end with, “My Baby Loves Me – Watch and Chain” and “Blue Skies and Dragonflies” The energy on stage was great, and one could tell that the band was having as much fun as the loyal crowd. This October, you can continue the local New Orleans swamp feeling:The Honey Island Swamp Band is coming back to the area. They are playing October 19th at The 8×10 in Baltimore and October 20th at Union Stage at the District Wharf.